Crypto enthusiasts were crushed over the Thanksgiving holiday when a fight over Bitcoin Cash and very thin liquidity prompted a massive price breakdown from recent highs. 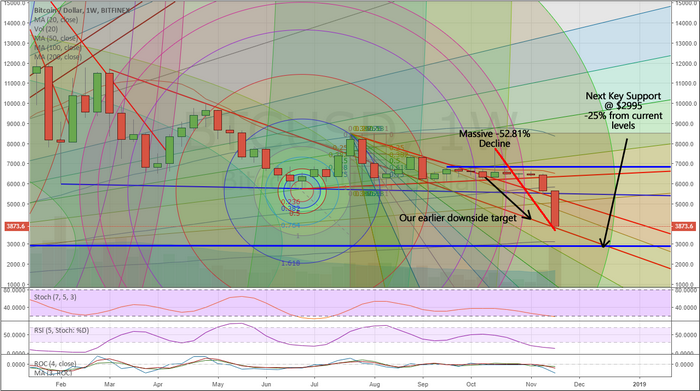 This downside move reflects a true price breakdown where Bitcoin bulls have to rethink their future strategies. Back in October 2018, we warned that price MUST rally above the support level near $6986 in order for any future upside advance to take hold. The following week, we saw a massive price rally that lasted only a few hours and trailed off back below the $6986 support level. While we waited to see if any future price move would prompt a rally above this level, the Bitcoin price levels continued to congest. The breakdown move over the past two weeks has been massive and hit our first target of $4000 as expected. From the recent highs, the downside move totals -52.81% so far. Our research team believes true support is near $2995 – a further -25% lower from current levels. This equates to a massive -65.85% decline in the past 40+ days. There may be an opportunity for fresh long trades near the end of this year. We’ll alert you to any opportunities we see in the crypto-currencies as they set up. Right now, we would warn Crypto longs and enthusiasts to be very cautious of any further breakdowns in price. If the $2995 level does not hold as support, we could very easily the $1860 level before the end of January 2019. 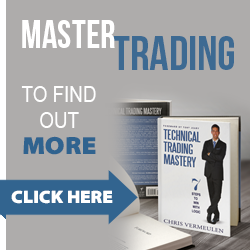 Please visit www.TheTechnicalTraders.com to learn more about how we can help you find and execute better trades. Our research team and proprietary price modeling systems continue to deliver success for our clients and members. We target selected sectors and trades for our members and deliver daily video analysis of most of the major markets to help our members stay ahead of market moves. Learn how we can help you find greater success in 2019 and beyond.